​Professional filming of your hunting adventure will send you home not only with your trophy, but with something spectacular to show your family and friends. You become the star in your own customized Legacy Hunting film. We have highly trained and talented Videographers to film your hunts with an array of professional High Definition (HD) camera equipment. 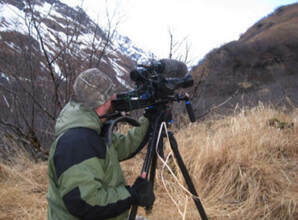 We can make cinema quality videos of your dream hunts. We tirelessly accompany your outfit and capture your trip in its entirety. Not only will we film the adventure highlights, but each and every aspect along the journey. We add the personalized touch of also documenting your thoughts, feelings, and expectations before, during and after the hunt concludes. This unique aspect of our filmmaking style closely matches that of the documentary film genre and provides you with a never-replicated eternal multimedia time capsule of your hunting experience. The crew is enthusiastic, highly personable and helpful. We listen to your direction, and rest assured, we value your input and suggestions. These films make the memory last beyond a lifetime. Rates: Rates vary according to the hunt, location, size of crew needed and length of journey. Please contact Mike Odin, 907-644-4868 or Eos Creative Media, LLC, 907-854-7264. We would be happy to begin a pricing analysis for you. Rates: Rates are dependent upon length and content of clip and vary depending upon the intended use of the footage. Contact Mike Odin, 907-644-4868 or Eos Creative Media, LLC, 907-854-7264.